The PlayStation 4's Remote Play functionality might be one of the system's coolest features, at least in theory: the idea of being able to switch between the big screen and the Vita for just about any game is undeniably appealing to a ton of people—especially the ones who share their televisions with loved ones or other nuisances. The good news is this: when Remote Play works, it works well. You can play tons of PS4 games on your Vita smoothly and without interruption, and they look pretty damn good on the Vita's small screen. The bad news is that after extensive testing over the past two days, I've found that, in its current state, Remote Play is inconsistent. It won't work at all on our office Internet, it's laggy and choppy on Stephen's slow Brooklyn connection, and even on my home network, which is rather fast, I can't move very far from my television without losing connection. Let's start with the good: sitting in my living room, six or seven feet away from my television, I was able to play through games like Assassin's Creed IV and Battlefield 4 on my Vita without an issue. 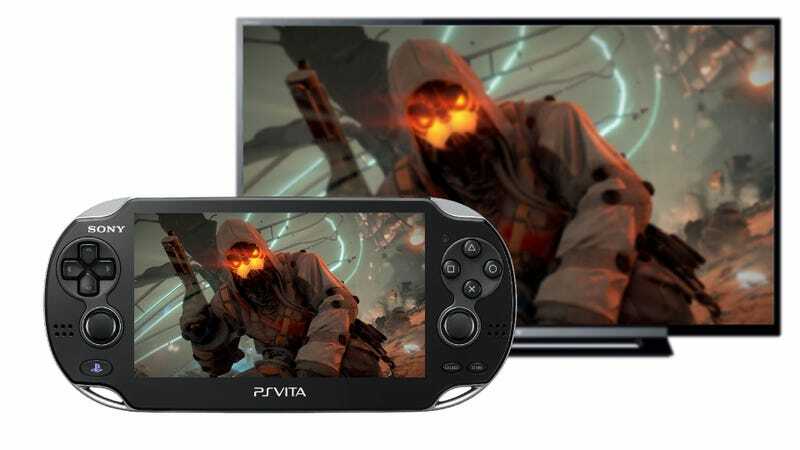 The Vita will mirror whatever is on the screen, and players can use the Vita as either their main screen, their controller, or both. Those niggles aside, games ran smoothly for me—at least within a short radius. When testing the system in different parts of my apartment, I found that games would occasionally lag at the 15-20-feet range, and shut off entirely after 20 feet or so. Here's what happened when I tried to take a Madden session from my living room to my bathroom, about 25 feet away from my PS4. In case you're wondering, my home connection speed, according to the PS4's connection test, downloads at 15.1 megabits per second and uploads at 1.0 megabits per second. In the office, we couldn't get Remote Play working at all, but you might chalk that up to Internet issues involving our office firewall: we're still looking into what happened there. Sony recommends that you keep your Vita and PS4 on the same WiFi network for optimal use, but just for kicks, I also tested with other Kotaku staffers to see if we could get this thing working with different WiFi networks. Could Patricia use her Vita from San Francisco to control my PS4 in NYC? Nope. Could I use my Vita from uptown Manhattan to control Evan's PS4 downtown? Nope. Other permutations were equally unsuccessful. So here's the verdict: right out of the box, Remote Play works well if you want to sit in the living room, playing PS4 games on a portable screen. Try to move much further, though, and you might have problems. At least for now.